The renaming of a local post office took a national stage Monday. 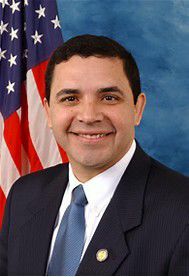 U.S. Rep. Henry Cuellar, D-Laredo, spoke on the floor of the House of Representatives about H.R. 1209, a bill he filed to rename the post office in Mission. The post office, located on 901 N. Francisco Avenue, will be named Mission Veterans Post Office Building if the bill is successful. “In naming this building, I wanted to make sure that people understood that we are dedicating this post office to the veterans as a reminder for their sacrifices,” Cuellar said Monday before he addressed the House. During his remarks, Cuellar specifically acknowledged Joaquin Castro, a lieutenant in the Army Air Corps who was born and raised in Mission. Castro joined the air corps in 1941 as a B-17 pilot in the Pacific Theater. He received the National Defense Medal, the Distinguished Flying Cross, and the Air Medal with an Oak Leaf Cluster. “I wanted to do this there in Mission and just wanted to thank all the veterans of Hidalgo County for the wonderful work that they’ve done,” Cuellar said. He explained that the renaming of a post office required legislative action which in turn required him to speak on the House floor. Late Monday, the measure was approved in the House and now moves to the other side of the capitol. “It’ll be over to the Senate and sometime in the future the Senate will take up the bill and once it passes it’s sent off to the president,” Cuellar said. As he explained his desire to honor the more than 2,000 veterans believed to live in Mission, Cuellar acknowledged from his window he could see a large group of people protesting for a permanent fix for recipients of DACA — Deferred Action for Childhood Arrivals. “The Supreme Court bought us a little bit of extra time because they refused to take the case that the president wanted to accelerate directly to the supreme court, so this actually buys us some time,” he said referring to the Supreme Court’s decision last month to not take up cases relating to the end of DACA. The program, enacted by the Obama administration, shielded about 700,000 young immigrants from deportation. In September 2017, Attorney General Jeff Sessions announced the program would be ending the program.